» Walk faster, Grandma: Seconds count! Walk faster, Grandma: Seconds count! Time’s up! A signal at Ellsworth and First in downtown Albany. 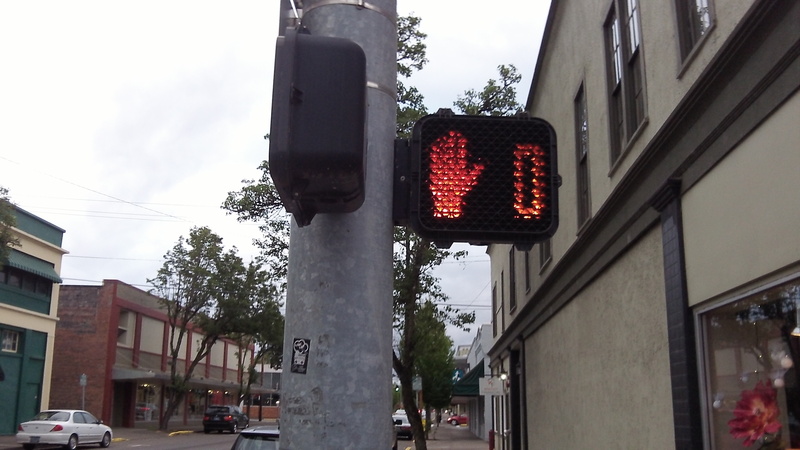 Have you seen those pedestrian traffic signals that tell people how many seconds they have left before — before what exactly? Before they can expect to get run over? The signals count down the seconds after the “walk” signal has changed to red. In Albany some of those signals have been in use for years. But downtown, ODOT installed new ones along Lyon and Ellsworth only recently. Ron Irish, the Albany city transportation system analyst, tells me those devices are called “pedestrian countdown heads.” As the name implies, he says, they are intended to benefit mainly pedestrians, especially the disabled or especially slow walkers. The countdown tells them to hurry it up. I wonder how that works if the clock goes down to one second left but the people in the crosswalk can’t move any faster no matter how hard they try. I’ve heard of no such reports, but I imagine panic might set in and lead to bad results.